A senior associate dean from the Olin Business School at Washington University in St. Louis was the third business school dean candidate to visit campus this week. Panos Kouvelis is one of five candidates on the shortlist to become the next dean of the GW School of Business, alongside John Hofmeister, the former president of Shell Oil, and Donald Siegel, the dean of the University of Albany – SUNY School of Business. Kouvelis, 52, has spent nearly two decades teaching at the Olin Business School, which is ranked No. 22 by U.S. News & World Report. He would also bring five years of experience as one of the school’s top leaders, where he has led the No. 2 ranked executive education program since 2009. During that time, he has doubled revenue and enrollment in the 11,000-student program by expanding it into Denver, Kansas City and Shanghai. Kouvelis did not respond to a request for comment about his candidacy. Kouvelis would also bring an engineering focus to a business school increasingly looking for more interdisciplinary opportunities. After earning a degree in mechanical engineering from Greece’s University of Athens in 1985, Kouvelis earned an MBA from the University of Southern California and a doctorate in industrial engineering and engineering management from Stanford University. He is currently the director of the Boeing Center for Technology, Information and Management, which uses connections with companies like Monsanto, Belden and Edward Jones to research how to improve business operations through technology. Media Credit: Photo courtesy of Wikimedia Commons. 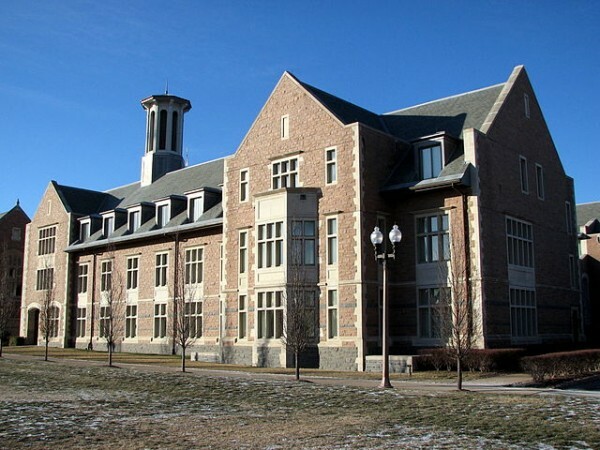 The Olin Business School at Washington University in St. Louis was ranked No. 22 in the country this year by U.S. News & World Report. A prolific researcher, Kouvelis was also one of five professors across the university to receive a distinguished faculty award last year. Two years ago, he served as an adviser to the U.S. Commerce Department on supply chain competitiveness. Kouvelis is one of two candidates who come from mid-level positions at high-ranking business schools, one GW professor who spoke on the condition of anonymity said. The professor said that these rising leaders would make the best type of candidate for GW – ranked No. 65 by U.S. News – but added that it would be a challenge to successfully recruit candidates who have already spent years at top-tier institutions. “The problem with those people is they might actually want to become a dean in that class of higher-ranked schools, so the ability to recruit them is also very challenging,” the professor said. One more candidate from another university will also visit campus next week before the school’s search committee picks three names to submit to University President Steven Knapp and Provost Steven Lerman. Lingxiu Dong, an associate professor of operations and management at Olin, described Kouvelis as collaborative and creative. Sergio Chayet, director of Olin’s master’s of science program in supply change management, said Kouvelis held faculty to be highly productive. “He brought in a lot of new personnel and made sure had people who would be highly productive and in line with new goals,” Chayet said. – Jacqueline Thomsen contributed to this report.